Igalia has begun implementing MathML in Chromium and working with others to improve interoperability. 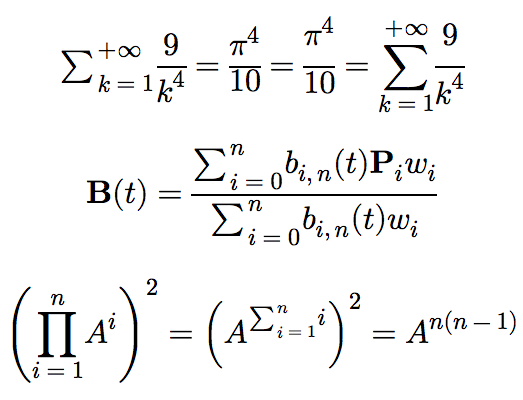 NISO has received a grant from the Alfred P. Sloan Foundation to support the implementation of MathML in Chromium. Math contents today are well rendered in Firefox and WebKit-based browsers. We believe they will be greatly accessible once MathML gets implemented in the most widely used browser, Chrome, which accounts for 60% of market share in desktop and 85% of market share in mobile platforms. We are seeking funding from the STEM publishing industry and organizations from the education and scientific sector that would benefit from the MathML implementation in Chrome and other Chromium-based browsers. Why fund raising? MathML implementation requires a substantial development effort that requires a team of browser experts working for more than a year to ship the initial implementation. This is one of the main reasons why we think collective funding is a great initiative as it would mean enabling MathML in all open source browsers with partial investment from the beneficiary organization. A W3C standard for mathematical and scientific content, already included in ISO/IEC, HTML5, ebook and office formats. Implemented in the open source web engines used by Firefox (Gecko) and Safari (WebKit). One of the most requested web platform features in Google Chrome (using Chromium) and Microsoft Edge (switching to Chromium). Why is MathML better than other solutions? W3C recommendation and web-platform-tests coverage for the best interoperability. Native implementation for efficient layout and automatic reflow. No external resources required except for purely stylistic information. Cross-compatible and high-quality rendering possible using TeX and OpenType MATH rules. Visual rendering fully controlled by font and CSS styling. Compatible with the other HTML5 technologies for best user and developer experience. Formula content works well with browser UI: zooming, select, copy & paste, find text, etc. Information properly exposed to assistive technologies. Why trust Igalia to implement MathML in Chromium? Uniquely capable of designing an implementation aligned with Google’s plans for Chromium. Open source consultancy that specializes in ALL the open source browser technologies: WebKit, Chromium, Firefox, Servo. One of the top contributors to WebKit and Chromium with extensive experience in standard implementation in browsers including CSS Grid Layout in Blink and WebKit, ECMAScript in JSC, V8 and SpiderMonkey, WebRTC, Web Crypto, Streams and Media source extensions in WebKit, full ARIA support in WebKit, CSS Clipping support in Servo, etc. Igalia already has experience in implementing MathML in Firefox and WebKit. The National Information Standards Organization (NISO) is the primary sponsor of this project through a grant from the Alfred P. Sloan Foundation. They have shown a great support on the MathML in Chromium initiative and will be sponsoring the main part of the project. Join the effort and become sponsor so that everyone can benefit from the MathML standard! We are happy to discuss other special sponsorship options if you are interested in contributing. Your interest and sponsorship can make MathML a reality in all open source web engines. Want to become sponsor? Check out the detailed information!